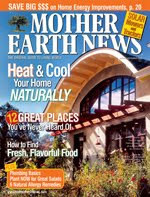 We have had a subscription to Mother Earth News for almost a year and we have eagerly devoured every single issue. Their tag line is "The original guide to living wisely" and that it is. They cover everything from renewable energy to modern homesteading and growing your own food to how to reupholster furniture. I love the can-do optimism throughout the magazine...you can do this too in three easy steps (okay usually more than three but you get what I mean). "We are at a point in history when time-tested wisdom can strike the contemporary mind as "radical". Be mindful how you build your home. These maxims satisfy both definitions for radical ideas. They suggest an extreme change from what we've been doing these past couple of centuries, but they also suggest that we are returning to principles that are the roots of human wisdom." See what I mean? So inspiring! So glad to see young people trying to live life properly. We first found Mother Earth News when we moved to the country in 1973. The previous owners had left a few copies behind(in the wood box by the stove). Try to find some early issues for stories such as "The $25 log cabin", perhaps e-bay. Check out my blog lifeunusual.blogspot.com Keep living the good life!